In the aged society, the rapid increase of people with neurodegenerative disease, especially Alzheimer’s disease, results in a great demand of new therapies to prevent age-associated dementia. However, until the present, there is no successful drug to restore the neuronal loss in these diseases. Neurotrophins (e. g. nerve growth factor; NGF) are recognized as important regulatory substances in the nervous system. Thus, neurotrophins are hopeful agents for the treatment of neurodegenerative disease. But, they have the issue in clinical practice due to these essential properties. To address this issue, considerable efforts have been made to find small molecules that have neurotrophic properties or are capable of enhancing the action of NGF in appropriate cell populations. Based on the above consideration, our group has been focused on the chemical studies on natural products having neurotrophic properties. Our study may provide additional evidence that neurotrophic natural products have great potential as lead compounds to develop non-peptide neurotrophic agents useful for the treatment of neurodegenerative diseases such as Alzheimer’s disease. Search for neurotrophic natural products. a) Chemical constituents studies of Illicium, Viburnum, and Chinese medicinal plants. b) Chemical constituents studies of Indonesian food plants. c) Screening neurotrophic compounds using PC12 cells and primary rat cortical neurons. d) Search for neurogenesis compounds using mouse multipotent neural stem cell MEB5. Synthesis of biologically active natural products by using palladium catalyzed reactions. a) Total synthesis of neurotrophic compounds. b) Structure-activity study to optimize active compounds. Molecular mechanism study of neurotrophic natural products. a) Molecular mechanism of action and role of neurotrophic compounds in neurons. b) Neurogenesis effects on mouse models of neurodegenerative diseases. Kubo, Y. Nishikawa, K. Harada, M. Oda, J.-M. Huang, H. Domon, Y. Terao, Y. Fukuyama. Tetranorsesquiterpenoids and Santalane-Type Sesquiterpenoids from Illicium lanceolatum and Their Antimicrobial Activity against the Oral Pathogen Porphyromonas gingivalis, J. Nat. Prod., 78, 1466-1469 (2015). Harada, M. Kubo, H. Horiuchi, A. Ishii, T. Esumi, H. Hioki, Y. Fukuyama. Systematic Asymmetric Synthesis of All Diastereomers of (-)-Talaumidin and Their Neurotrophic Activity, J. Org. Chem., 80, 7076-7088 (2015). Kubo. Search of Neurotrophin-mimic Natural Products for Prevention and Treatment of Neurogenerative Disease, Yakugaku Zasshi, 135, 1147-1152 (2015). Harada, A. Imai, K. Uto, R. G. Carter, M. Kubo, H. Hioki, Y. Fukuyama. Synthesis of Jiadifenin Using Mizoroki-Heck Reactions. Tetrahedron, 71, 2199-2209 (2015). Kubo, M. Gima, K. Baba, M. Nakai, K. Harada, M. Suenaga, Y. Matsunaga, E. Kato, S. Hosoda, Y. Fukuyama. Novel Neurotrophic Phenylbutenoids from Indonesian Ginger Bangle, Zingiber purpureum. Bioorg. Med. Chem. Lett., 25, 1586-1591 (2015). Harada, C. Arioka, A. Miyakita, M. Kubo, Y. Fukuyama. 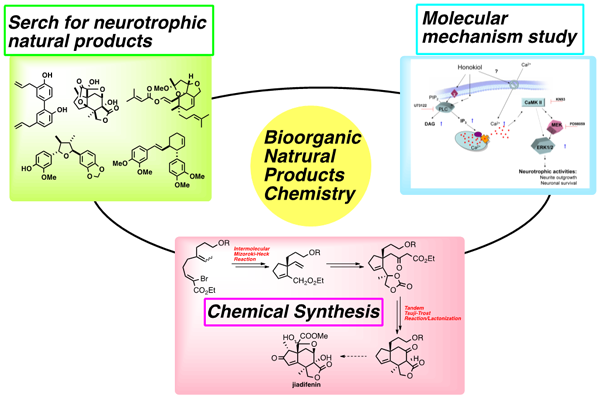 Efficient Synthesis of Neurotrophic Honokiol Using Suzuki-Miyaura Reactions. Tetrahedron Lett., 55, 6001-6003 (2014). Kubo, Y. Liu, M. Ishida, K. Harada, Y. Fukuyama. A New Spiroindene Pigment from the Medicinal Fungus Phellinus ribis, Chem. Pharm. Bull., 62, 122-124 (2014). Harada, K. Makino, N. Shima, H. Okuyama, T. Esumi, M. Kubo, H. Hioki, Y. Asakawa, Y. Fukuyama. Total Synthesis of Riccardin C and (±)-Cavicularin via Pd-catalyzed Ar-Ar Corss Couplings, Tetrahedron, 69, 6959-6968 (2013). Kubo, R. Ishii, Y. Ishino, K. Harada, N. Matsui, M. Akagi, E. Kato, S. Hosoda, Y. Fukuyama. Evaluation of Constituents of Piper retrofractum Fruits on Neurotrophic Activity, J. Nat. Prod., 76, 769-773 (2013). Makino, K. Harada, M. Kubo, H. Hioki, Y. Fukuyama. Total Synthesis of Bisbibenzyl Dibenzofuran Asterelin A via Intramolecular Oxidative Couping, Nat. Prod. Comm., 8, 915-918 (2013).